I didn’t even think that it was possible. All bandwagons and Bay Area residents aside, we can all agree that there’s at least a part of us that despises the Warriors. Maybe it’s because you want competition in the NBA; maybe it’s because you’re a LeBron fan; or maybe you’re a Rockets or Thunder fan who knows that you’d have a real shot at a championship weren’t for five All-NBA stars playing on the same team. It was only four last year (which we all still hated), but adding DeMarcus Cousins, an All-Star big man, to a team whose only weakness has ever been their play in the paint, is just cruel. And the team pictures they took at media day on Monday fully display that cruelty. Kevin Durant looking smug and Klay growing a new beard just add insult to injury. My goodness. 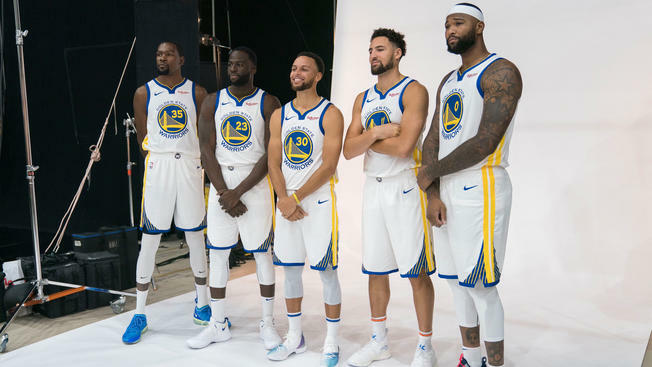 In all likelihood, these are the first team pictures of the 2019 NBA Champions, who will be the first team to three-peat since Jordan’s Bulls. The Warriors even got good news today, as Cousins’ recovery from a torn Achilles he suffered last January is progressing better than expected and that he should be ready sooner than expected. We can root against the Warriors all we want, but as long as they roll out a Western Conference All-Star team and continue to have opposing stars fall down injured at their feet (Chris Paul, Kawhi Leonard, Kyrie Irving, etc.) during the playoffs, we won’t be seeing a new champion this season. Here’s to fighting for second place!